Zeffer Cider is the next in my series of Real Cider Reviews from New Zealand. Zeffer’s story is one about experimentation and having a goal in mind to make real ciders in the styles that Sam (Zeffer’s head cider maker) wanted to make. “Zeffer Cider Slack Ma Girdle” is the most traditional in the range. So that seemed the best place to start. I’m continuing my quest to find quality craft ciders made in New Zealand. The Aussie market has more than its fair share of rubbish ciders that have their origins in the land of the long white cloud. I started to think that either New Zealanders can’t make cider or the Kiwis must be hording their best cider sending us the rest. That was until I started this mission. The first quality cider was the 8 Wired Dry Oak Sparkling Cider. Now I think I’m onto another winner. 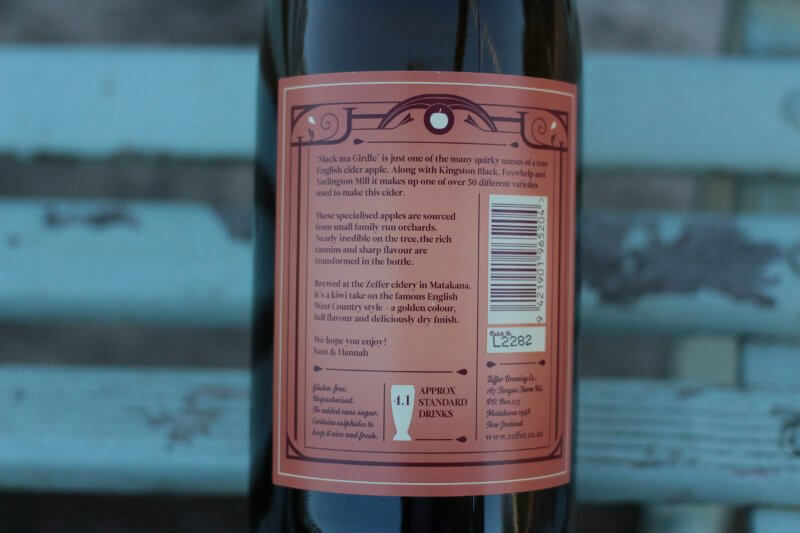 Zeffers started out in 2009 when the experienced wine maker Sam, wanted to make cider that he would want to drink. Choosing to make a cider the same way wine is made: From real fruit. Slack Ma Girdle is aiming to stand up to the likes of the English West Country. Like its English fore bares it uses many cider making apples including the rare Slack Ma Girdle apple. In fact there are over 50 types of apples in the Slack Ma Girdle cider. Is this like KFC’s 11 herbs and spices? You know; chuck ’em all in and by some fluke it seems to work? These apples are sourced from the local area. Slack Ma Girdle is fermented in small batches making it a season treat. I removed the muselet and cork and poured from the Zeffer’s 750ml bottle cider into a pint, I was greeted with a full and traditional scent. This is thick like molasses and super ripe apples and that proper cider smell. The smell might allude to this being a sweet cider but it’s anything but sweet. There is no escaping the fact that this is a dry cider, but dryness is not the trump card. That roll has been filled by the fruit, ripe apples and maybe even pawpaw and mango. The apple flavours are rich and complex. Heavy on the tannins but somehow remains well balanced and moreish. The taste hangs around in your mouth giving you time to sort thought the flavours. Don’t think of it as a hot day refresher. It’s more like a settle in, slow drink. Even if you drink it slowly, the Slack Ma Girdle holds it head above the dark amber cider all the way to bottom of the pint. Pairs well with Sunday afternoons and a good book. I don’t know if it was a fluke or if the guys from Zeffer Cider locked themselves in the shed for 6 months to work out that these 50 apples make a great cider. One of my yard sticks of how much I like a cider is the need to go back to the bottle shop for another because I’ve just enjoyed the first one too much and forget to write up my tasting notes. So here is the big call: not only is this the best Kiwi cider I’ve ever had, but I think it could be in my top 3 dry ciders.